I last sailed on the Oosterschelde in Jan 2018 from Tenerife to Cape Verde where I heard from the crew that they would most likely be coming to Scotland during the summer. 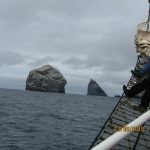 When I returned home I had a look at the Oosterschelde schedule for the coming year and saw that they were planning to sail to St. Kilda in August, an island I’d wanted to visit for a long, long time. 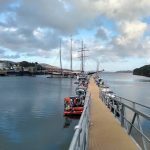 I joined the ship on Thur 9th Aug in Oban where it was moored to the nice new jetty in the harbour. It was great to meet all the crew of this fantastic ship again. 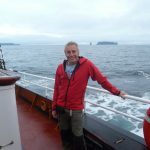 During the initial briefing for the guest crew the skipper, Maarten suggested that the voyage would be planned to try and cover whatever we, as guests wanted to get out of the trip and as someone had mentioned the Corryvreckan we motored through the night and arrived there around 00:30. It was very dark so we couldn’t see much but we certainly felt the effect when we throttled back on the engines. 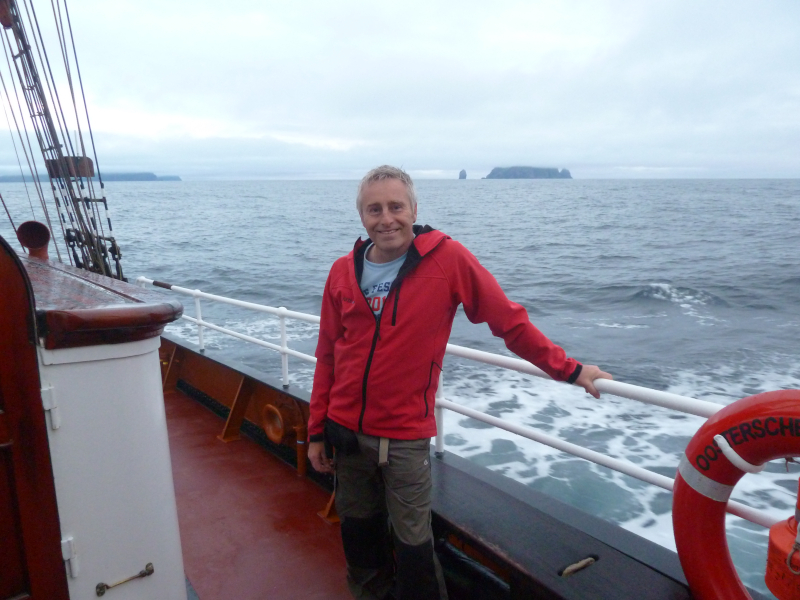 After messing about at the Corryvrecken for a while we set course for Tobermory and arrived the next morning. Most of the guest crew went ashore and had a wander around and some of us visited the distillery for the tour and I bought a nice bottle of Ledaig. 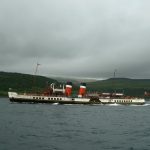 We set sail later that day on our way to Muck and passed the Lord Nelson as it was coming into Tobermory. We arrived late in the evening at Port Mòr and some of the guests and crew went ashore for a walk, whilst I stayed on board. 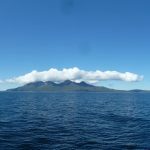 Sat morning was beautiful and sunny so after breakfast most of us went ashore to explore the island which is quite small but very beautiful with great views of Eigg, Rum and the mainland. 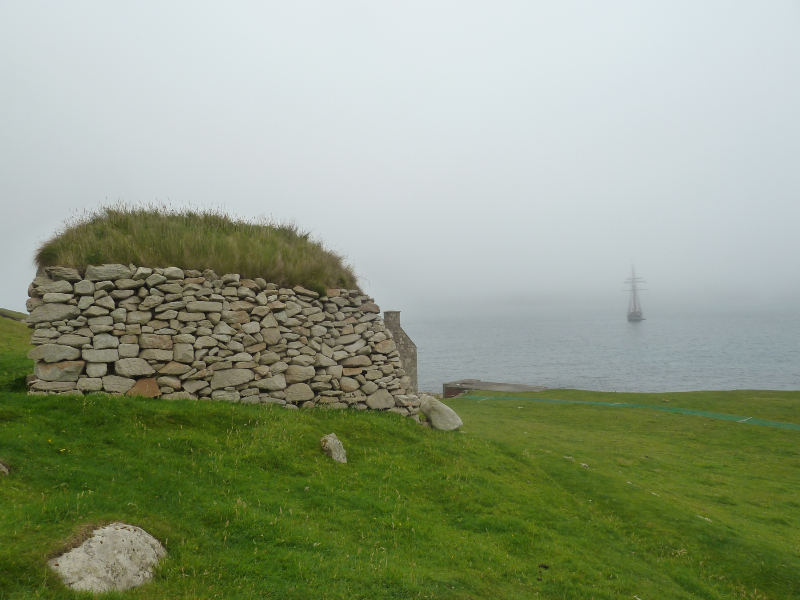 We joined the ship later that day and set sail for the Talisker distillery on the Isle of Sky. 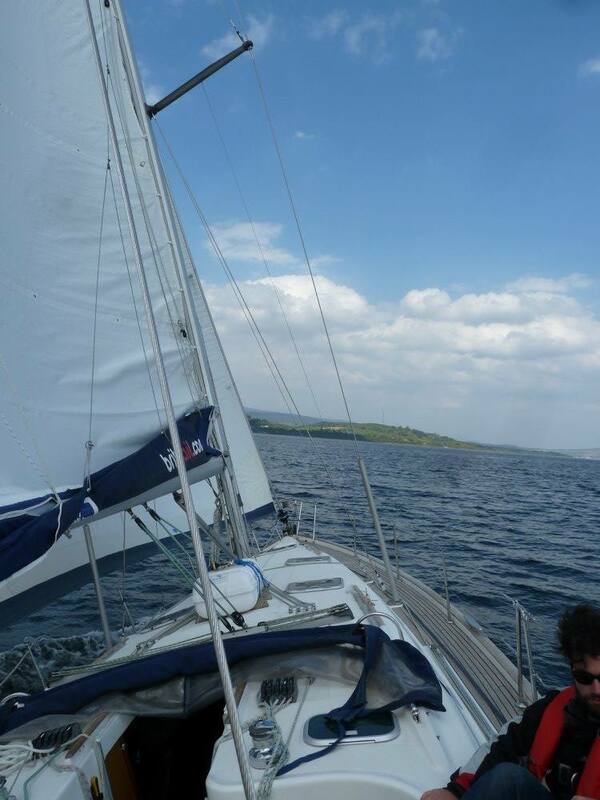 A very nice day of sailing in great weather. 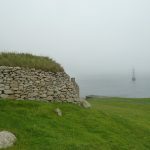 We anchored in Loch Harport and after dinner went ashore to the local pub, the Old Inn, Carbost. After spending some time outside enjoying the evening air the midges got the better of us so we heading into the pub to catch the thankfully final ‘tune’ from a very drunk bagpiper. I got chatting a guy called Marten from Germany who was on holiday with his two kids, so I invited then on a tour of the ship and arranged to pick them up at the jetty at abut 12:00 the next day (Sun). Marten and his kids loved the tour and thought the ship was fantastic. 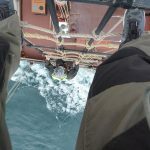 We had a short briefing from the skipper who updated us on the weather report and suggested that if we wanted to make it to St. Kilda then now was as good a time as any with a good weather window giving us enough time to get there and back before a major storm moved in from the South West. So we set sail and headed through the Sound of Harris en route to St. Kilda and I took my turn on the first watch (red) that night. Once we cleared the Sound of Harris it was open water between us and St. Kilda and sailing through the night we caught first sight of the islands looming out of the mist at around 07:00 on Mon 13th Aug. We anchored in the bay of Hirta and after one of the crew checked in with the island warden we all went ashore to explore this amazing island. As I said before I’d always wanted to come here and it surpassed all my expectations. 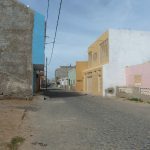 I knew a bit about the island’s history from books and documentary films but being here walking the village street and going into some of the houses brought it all to life, the hardship, the isolation, the community, the stark beauty and force of nature and a life quite literally on the edge. 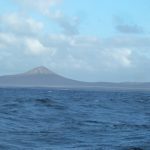 There is quite a bit of activity on the island as the MoD have a base an NTS station and a resident ranger as well as a number of researchers from Edinburgh University. 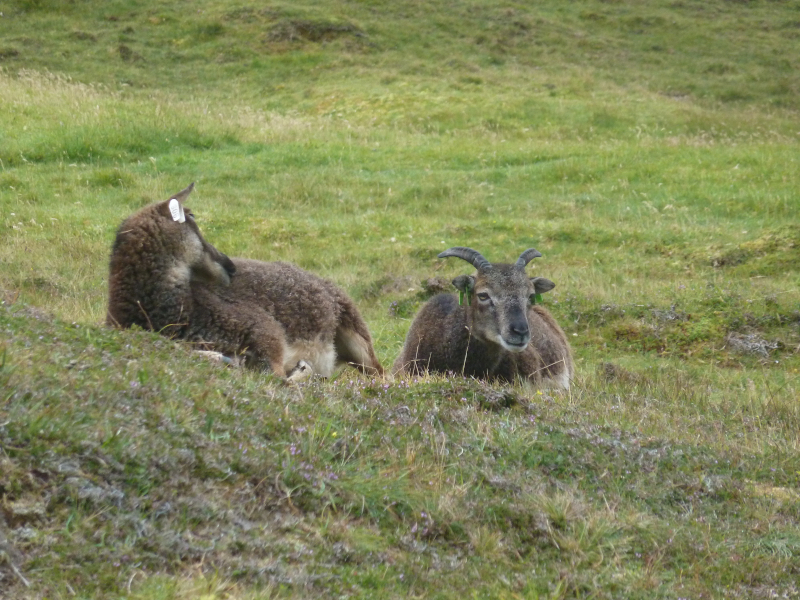 I got chatting to a couple of the researches from Edinburgh who were conducting a vegetation study of the plants which formed the main diet of the local, wild Soay sheep. 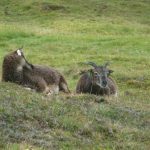 The study of these wild sheep is apparently one of the the longest running mammalian studies in the world. The sheep probably arrived with the first settlers around 4000 years ago and until 1932 they were only on the small Isle of Soay but in 1932 the flock of 107 were moved to Hirta where they have been ever since and now number 1401 and appear to be getting larger. I could easily have spent a lot longer on Hirta but due to the encroaching weather front we had to leave later that day and headed towards the isle of Boreray and Stac an Armin, spectacular rocky outposts to the North East of Hirta absolutely teeming with sea birds. 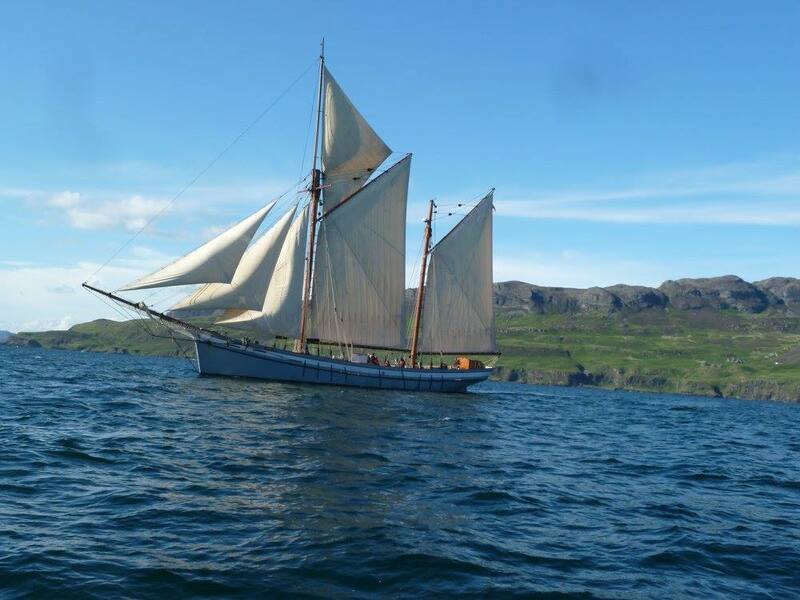 We then set sail again with Dunvegan in the Isle of Skye our next port of call. 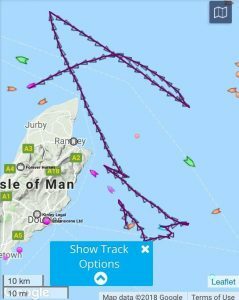 We sailed through the night back through the Sound of Harris with the lights of Leverburgh and all the warning buoys making it an interesting watch that night. Come the morning the Approaching weather front began to catch up with us and we picked up a fair bit of speed topping over 8 knots at times, which was really exhilarating. 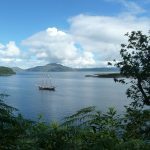 We dropped anchor in Loch Dunvegan and most of us headed ashore to visit Dunvegan Castle, the clan seat of the clan MacLeod, always worth a visit, especially in the company of a fellow MacLeod from Nova Scotia. It was a really wet day but the gardens were still beautiful followed by a quick dinghy tour around the loch to visit seal colonies, a great day all round. Leaving Dunvegan later that day we dropped anchor on Loch Snizort Beag for the night. Wed morning was beautiful with light winds in the loch but Maarten expertly maneuvered us around and out to sea under sail alone where the winds picked up significantly and pretty soon we were making over 6 knots on our way to Tarbert on the Isle of Harris arriving there in beautiful weather at around 15:30. Some of us went ashore and checked out the new gin distillery. 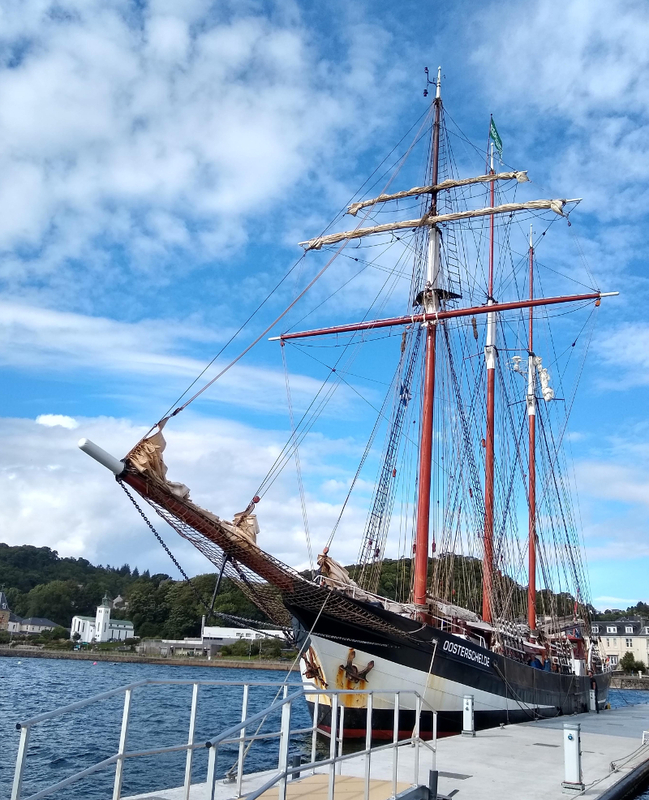 We set sail from Tarbert on Thur morning heading for Stornoway with more great sailing, beautiful weather and fantastic views of the Shiants, and dolphins which are always a welcome sight. Manon and I spent a good deal of the afternoon guiding some of the guest crew up to the yards to experience the view in fairly calm conditions. We planned to spend two nights in Stornoway where have a lot of family from my fathers side so I called my cousin Rodney who came down to the ship and I gave him, his daughter and grandson a tour of the ship. I spent the next day with Rodney driving around the island visiting some local sights and some of his old friends, a great day out and fantastic to catch up with long lost family. That night after a few beers a few of us headed up to Lewes Castle fully expecting it to be closed, as it was but a really nice guy who was locking up invited us in a gave us a private tour which was fantastic. The community really have done an amazing job on the restoration. We left Stornoway on our last sailing day heading for our final destination of Ullapool. There were strong winds and we topped 10 knots at one point so we made good time which for most of us meant the end of the trip came too soon. Of course the end of a voyage is always a good excuse for a party and this was no exception, a great barbecue accompanied by a few beers and later on some very dubious dancing, including our version of ceilidh-disco fusion, you really had to be there. Sun morning meant we had to leave the ship so we said our farewells to the amazing crew and most of the guests caught the bus to Inverness for onward journeys, a last few beers and goodbyes to good friends it was onto the train and heading home, until the next time Oosterschelde. 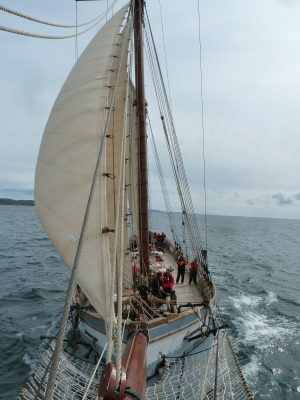 When I saw that the Morgenster was taking part in the very first Three Festivals Regatta and was sailing from Liverpool to Dublin on the first leg I didn’t hesitate to sign up. 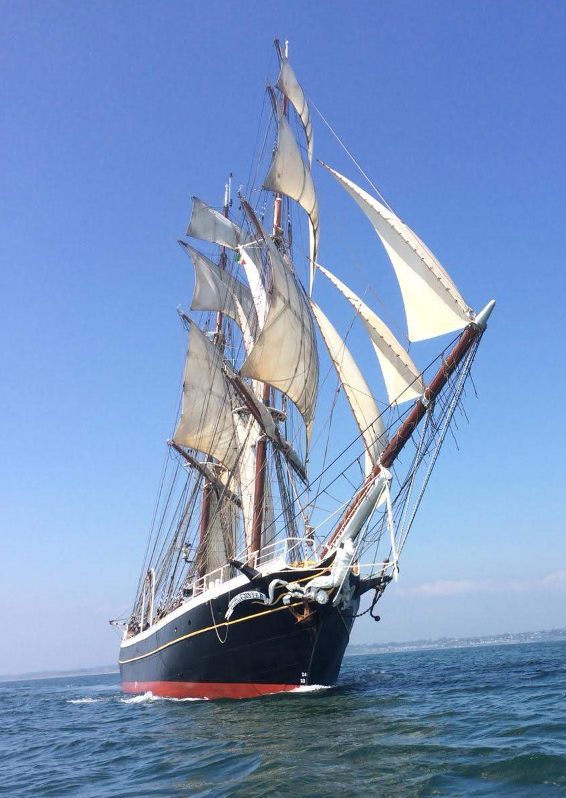 This was the first tall ship I sailed on back in Feb 2017 and I had such a fantastic time it was a no-brainer to join this wonderful ship once again. I’d never sailed in a regatta before so I had no idea of what to expect. I joined the ship in Liverpool on Sun 27th May and it was great to meet all the crew again, and of course the new guest crew. 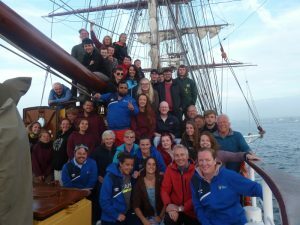 There was quite a good mix of guests with a group from Dublin with Sail Training Ireland, a group of young company sponsored apprentices and the rest of us. I was on white (wit) watch with our first stint on Mon/Tue 00:00 – 04:00. 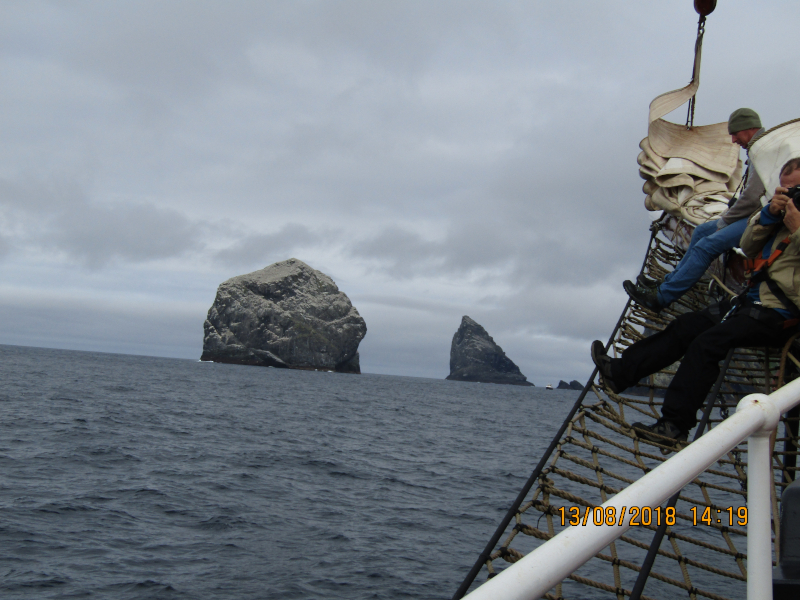 By Tue we were making good speed but the sea was a bit rough and some of the guest crew were the worse for it with quite a few wee buckets being carried around. By this time we were well ahead of the other class A ships, Lord Nelson, Belem and Belle Poule with only one other ship in the race ahead of us, Maybe. 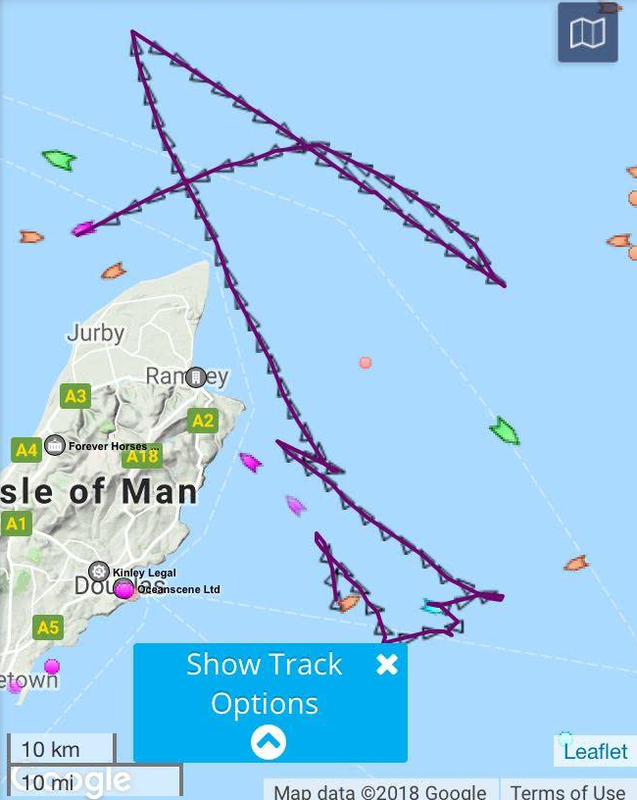 With the wind dying away it was getting more difficult to gain any distance North to follow our planned route around the Isle of Mann, but with a lot of tacking and the skill of our captain Jakob we eventually made headway and rounded the North of the island. When we did eventually catch some wind we overshot our way point so had to backtrack a bit. On Wed night we anchored near Lambay Island just off the Irish coast and watched a beautiful sunset. It has to be said that this voyage was memorable for many, many reasons, not least of which were our musical entertainment, especially the force of nature that was Seamus, a hard act to follow, belting out such classics as ‘five fresh fish’ as never before. which involved a very large cup and one hell of a party afterwards. 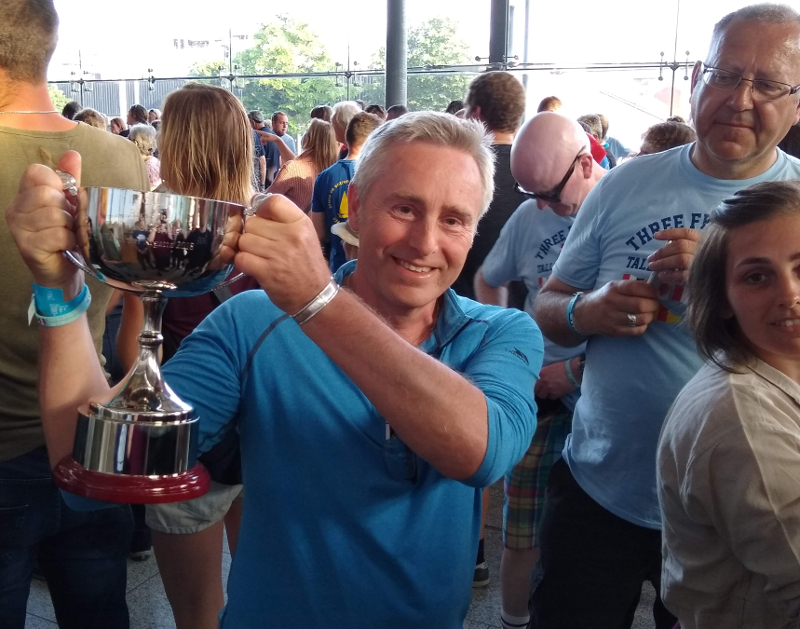 A great voyage to remember for so many reasons, good friends, great sailing, fantastic musical entertainment, beautiful weather and to cap it all “we won”!!! 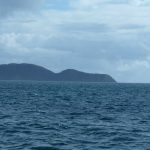 On my last three sailing trips I was island hoping, firstly in the Cannaries on the Morgenster then off the west coast of Scotland on the Irene and the Chimere. I wanted to experience a longer open ocean voyage to see if I was cut out for such trips and whether or not I’d enjoy it. 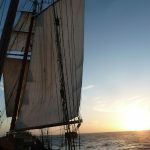 I found suitable trip on classic sailing on the schooner Oosterschelde, a Dutch ship out of Rotterdam. 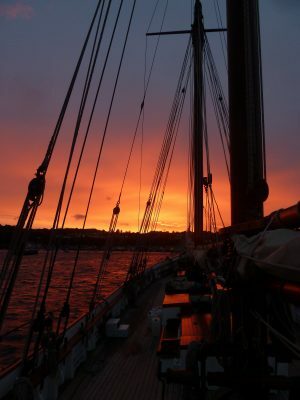 Unlike the Morgenster which was a square rigger the Oosterschelde is a three masted gaff rigged schooner with only one top sail and upper on the fore mast. So there would be much less sail on the yards. I joined the ship in Santa Cruz de Tenerife on Tue 2nd Jan 2018, met the crew and other guests then spent the night in port. 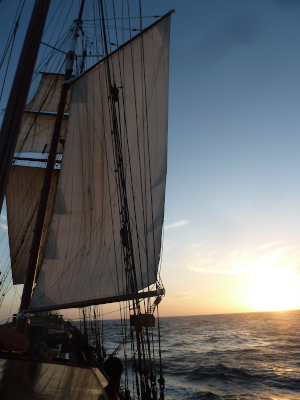 We set sail the next day heading South for the Cape Verde islands. This voyage gave me my first taste of the watch system, on previous voyages we were never at sea long enough to warrant it. The watches were split into red, white and blue, the colours of the Dutch flag. I was on blue watch and our first shift was 00:00 – 04:00 which wasn’t so bad. Unfortunately, probably on the flight to Tenerife I had picked up a virus and developed a very bad cough which meant I barely slept for the next four or five nights. I felt like crap and coupled with the rolling watch system (00:00-04:00 / 04:00-08:00 / 08:00-14:00 / 14:00-20:00 / 20:00-00:00) I was only vaguely aware of the times and on at least two watches I was completely flummoxed, one time getting out of bed convinced I had missed my watch thinking it was lunchtime only to find everyone having breakfast. The other time I was really struggling through my watch feeling really weak but I kept my spirits up by thinking of the breakfast I would have quite soon, only to find out it was nearing 04:00 and not 08:00 as I thought. I slowly started to feel a bit better and finally got some sleep. 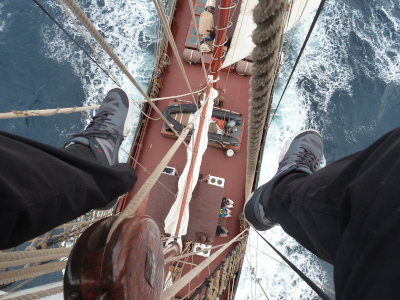 I read a lot on this voyage as there was a lot of sitting round with not much to do on the open ocean. 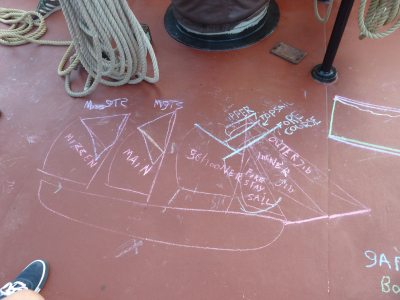 The captain, Maarten kept us amused, entertained and educated with a variety of ‘classes’ on the ships rigging, weather patterns and navigation . On one particularly clear starry night he a gave a captivating talk on the constellations and the Greek mythology associated with each of them. 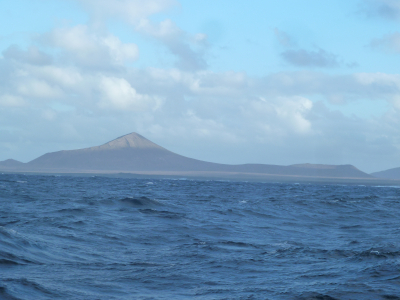 After 6 days at sea we caught sight of Sal, where I would leave the ship. Sal was as featureless as I’d expected and my only reason for leaving the ship here was the international airport for flights home. 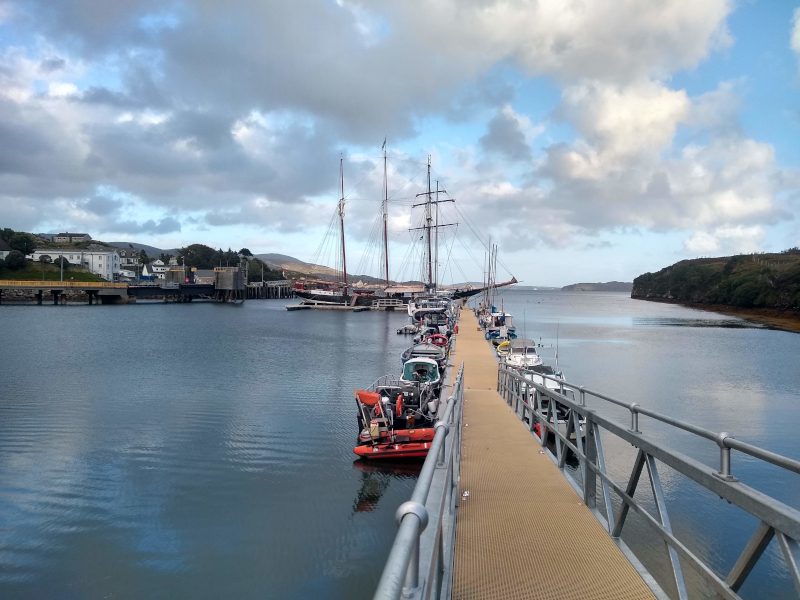 When we arrived in the port of Palmeira we performed the ‘where can we moor’ dance after first being told to move by the harbour master, then by the harbour police and once again by the harbour master, before finally being allowed to stay in one place. Many of us were due to leave the ship the next day so in the morning the first mate Jan-Willem took our passports off to the airport to get our visas. This also proved to be a bit of a to and fro when he was told at the airport he had to get the visas at the port then at the port being told to go to the airport, then they closed for lunch. Eventually Jan-Willem returned and we each made our way ashore. Antoine and I grabbed a taxi bus heading South to Santa Maria and I parted with him at his hotel. I then spent the best part of a couple of hours trying to find my hotel which was hidden away on one of the back streets. As I said before Sal is rather featureless and there’s not a whole lot of things to do, If you like beach holidays then it’s fine, but not for me. Luckily I was only staying a couple of days. The day I left the island I had another bit of a hiccup when the border guard at the airport wanted to know where I got my visa, why I didn’t have a receipt etc. etc. for a brief moment I thought he wasn’t going to let me leave. 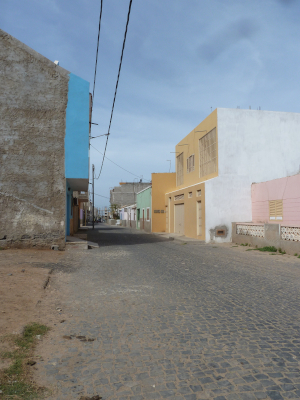 If I go back the the Cape Verde island then I think I’ll join the ship in Sal and sail around the other islands which have much more to offer and well worth a visit according to the crew of the Oosterschelde…next time. 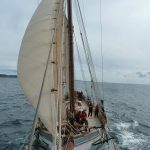 Having now sailed in the square rigger Morgenster and completed my RYA competent crew training I was on the lookout for another voyage when I spotted a trip on classic sailing on a smaller ship, the ketch Irene. 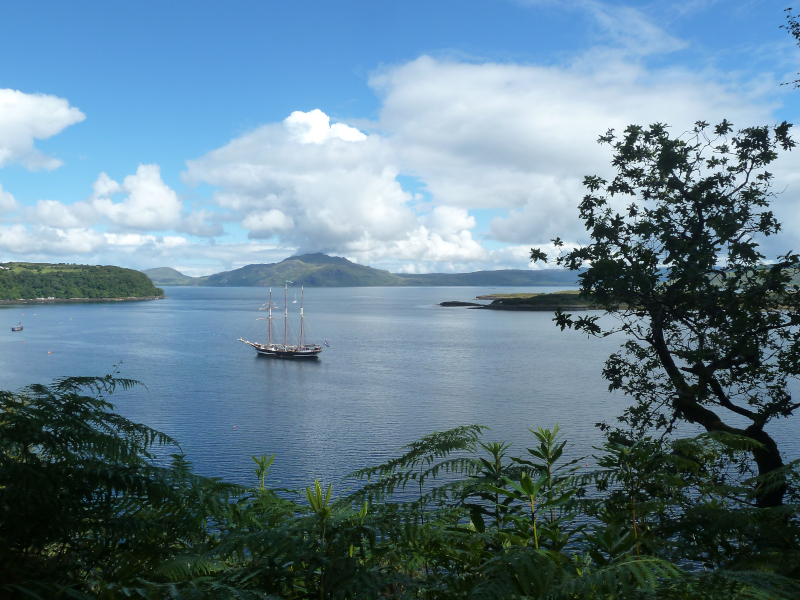 The ship was planning a voyage from Oban around the small Isles and Skye, a part of Scotland I love, so I signed up. 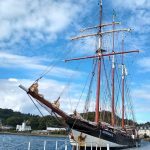 I joined the ship on Mon 5th June 2017 in Oban. Early next morning the skipper, Ieuan told us there was a storm predicted for later so we headed for the shelter of Tobermory bay under engine power. Spent the day waling around Tobermory, it was a bit wet and miserable but Tobermory is always a nice place to visit we even had the treat of seeing the paddle steamer Waverley in port as well as a most fantastic sunset that evening. Most of us eventually congregated in the pub to warm up and dry off. We were reliably informed by Ieuan that the storm did arrive in the middle of the night although most of us slept right through it and didn’t even notice. The morning was beautiful when we set sail for Eigg this was great sailing with fantastic sunshine, we launched the dinghy to buzz round the Irene for a photo shoot. 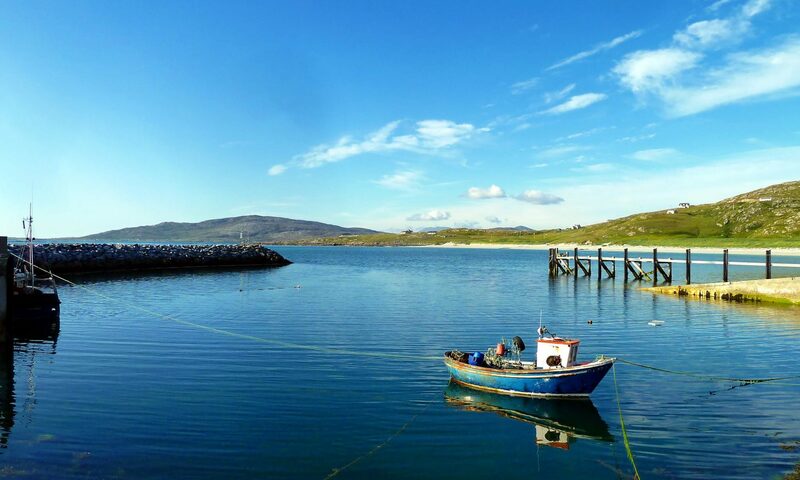 After a night anchored at Eigg we set off for Skye on another glorious sunny day, dropping anchor in Loch Slappin we went ashore for a wander around and a coffee at the local cafe. There were some great views of the Cuilins and the ship at anchor. The next day was another glorious sunny day but with light winds so we eventually had to use the engine to get us to anchor in Loacaline where we went ashore to the local pub in the evening. the morning of the 10th June was not promising and we had very heavy rain for the first part of the day. 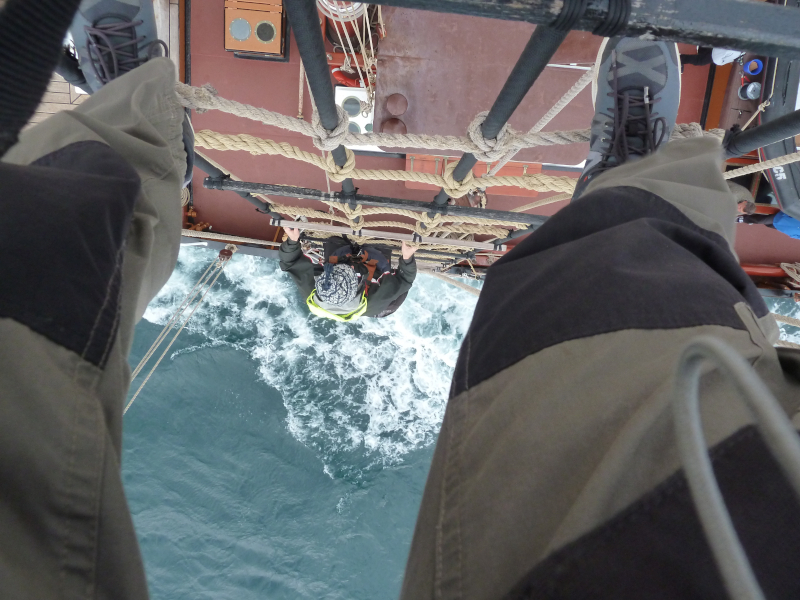 I learned to very important lessons that morning hoisting sails in heavy rain, firstly make sure the cuffs of your waterproof are pulled tight otherwise the rain just runs up your arms, and secondly a pair of deck Wellies is a very good idea , my feet and arms were soaked. The weather cleared later and we had a very sunny afternoon, some of us even went for a swim. It was good sailing back to Oban and I took the helm all around Kerrera and into Oban harbour but Ieuan took over when we had to play dodge the ferries when looking for a mooring buoy. 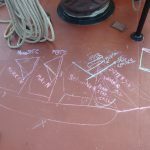 After getting the sailing bug during my first voyage on the Morgenster I was keen to learn a bit more about sailing so I enrolled on a RYA competent crew training course being run by BritSail out of Kip Marina. This proved to a memorable trip, but for very different reasons from the Morgenster. We sailed in some of the most beautiful areas of the West of Scotland, leaving Inverkip we sailed up towards Colintraive practicing anchoring and maneuvering techniques. Then onto Tighnabruiach mooring to a buoy, launched the dinghy then off for a well earned pint. Next day we sailed the beautiful Kyles of Bute then across Loch Fyne to Tarbert with more mooring practice and man overboard drills. 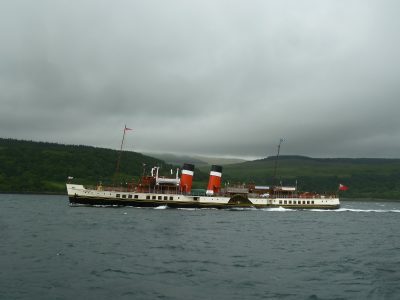 We then headed back through the Kyles on onto Gare Loch dodging nuclear submarines and eventually mooring at Rhu marina. 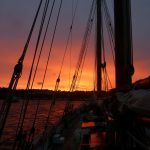 Our final sail was at night where one of the other crew who was going for his coastal skipper accreditation had to navigate with only the information we at the helm gave him, depth beneath the keel, heading etc. It was tougher than I thought, trimming the sails, looking out for marker buoys whilst learning what all the different lights and sequences meant, keeping track of headings, depth whilst trying to stave off the cold. But we made it safely back to Kip, cold and tired but well worth the experience. 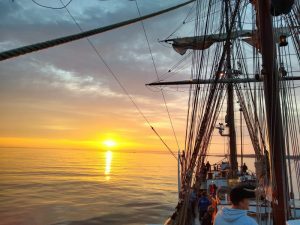 Towards the end of 2016 I was reading Facebook posts from a friend who was sailing on the Bark Europa tall ship heading for Antarctica. 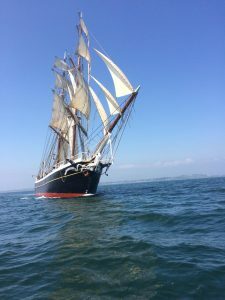 I was not only amazed at the voyage she was on but also intrigued as to how one gets on board these tall ships, so I followed the link she posted to classic-sailing.co.uk where a whole world of possibilities opened up with numerous ships and a huge range of voyages available. 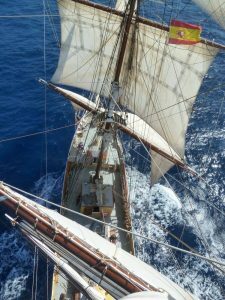 Having never sailed in a tall ship before I felt that heading off to Antarctica was probably too ambitious for my first voyage so I opted for a trip to the Canary Isles, which I’ve visited a few times in winter. The ship I signed up on was the square rigged Morgenster, (Morning Star) a Dutch ship built in 1919. I joined the ship in Santa Cruz de Tenerife on 4th Feb 2017. 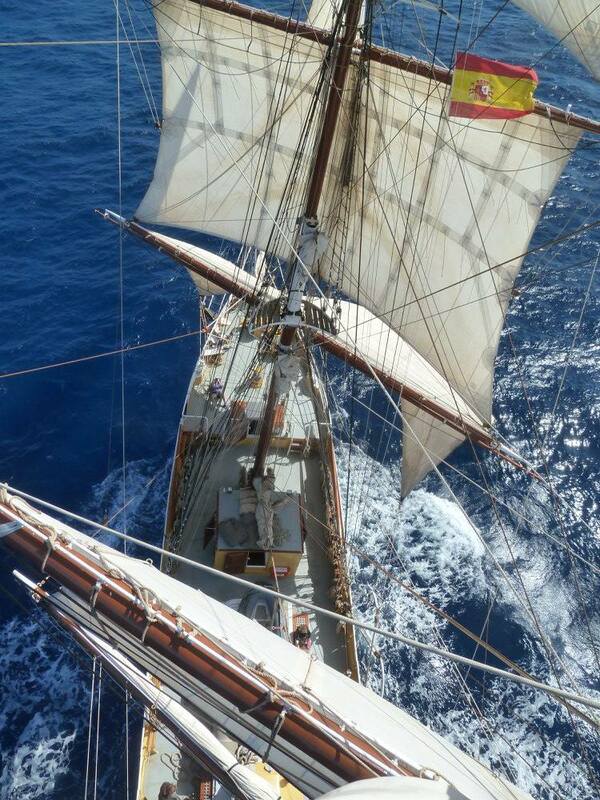 We set sail for La Palma, then La Gomera then finally back to Tenerife. 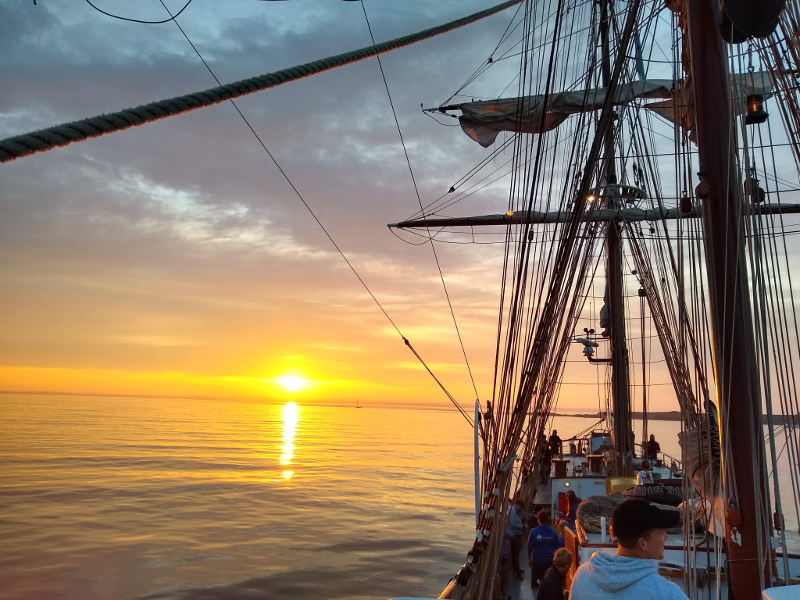 This was a fantastic introduction to tall ship sailing, great crew, great guest crew, fantastic weather and absolutely awesome sailing on a beautiful ship. 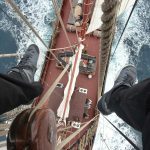 I learned so much on the voyage about rope work, sail work tall ships in general but mostly I had one of the best experiences of my life, I was hooked!